We fully engage with our clients to understand their unique business and technology needs. Hadi Makki, founder and CEO of Cantara Sciences, is an experienced senior executive who has been providing strategic consulting and advisory services to decision makers across many industries. 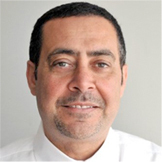 Previously, Hadi served as head of global operations for Prolifics, an IBM Premier partner, and an award-winning end-to-end systems integrator. In all these roles, he successfully managed every operational aspect of the business. A pioneer in the field of Health Informatics, with a long and distinguished career with the New York City Department of Health and Mental Hygiene, where he held several key executive positions.